Hunting for Easter Eggs in Dickeyville! 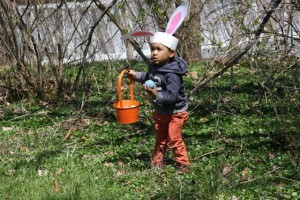 Last Saturday, a many-years-old Dickeyville tradition repeated itself in the form of our annual Easter Egg Hunt. Informally organized each year by a parent who volunteers, this hunt tends to take place in the section of Gwynns Falls Leakin Park adjacent the waterfall near the center of the village. 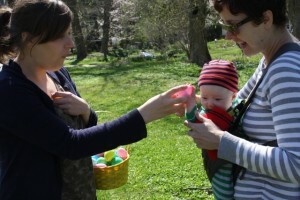 This year’s organizer, village resident Amy C., enlisted the help of several other villagers (not all of them parents themselves) to fill plastic Easter eggs with treats for our intrepid contestants. 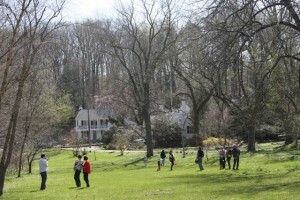 Eggs were then hidden over a broad swath of meadow, garden, and woods for village children ranging from 4 months to the upper reaches of elementary school to find. Many of the village’s families turned up to partake of the festivities. We’re very fortunate to live in a place where such a thing can be reliably thrown together by volunteers consistently every year, and to have such a beautiful setting in which to carry it out. The weather couldn’t have been better for the event had it been selected from a catalog. And certainly, our children seemed to enjoy the fun. Thanks to Amy and all the Dickeyvillains who collaborated to make this a beautiful occasion! Cassie loves Great Books, interesting pedagogical models, and being the plan-and-poetry bridge between idealistic endeavors and their success. She also likes Dickeyville, and all the amazing people she's met here - not to mention a few interesting wilder creatures. She lives near the river with her husband and their baby, Sam, and hopes her neighbors enjoy the orange tulips.